Why Does Piebaldism Affect Behaviour? In January, 2003 after the Bradford championship show, the NGS (The National Gerbil Society of Gt. Britain) held its annual general meeting. At this meeting I put forward a proposal to give the mottled coat variety of the gerbil a provisional standard. I was pleased when this proposal was put to a vote and unanimously passed. Prior to this meeting the mottled gerbil has had to compete in the collared class and was often discriminated against as the white markings on this variety often well exceeded the acceptable amount of white markings that are laid down for the collared standard. The mottled gerbil itself is a beautiful coat colour variety, and like a snowflake no two mottled gerbils are ever alike. This fact when coupled with additional darker patching of the base coat colour (the unusual effect of dark patching on gerbils has also been recognised in this new standard) it can look truly stunning when presented on the show bench. Even though at present this new standard cannot go forward for Best in show, I feel it will gain a full standard in the not too distant future as the merits of this coat variety rank very high, when compared to other white marked varieties in other fancies. When the breeding aspects of spotted, patch, collared or mottled gerbils are discussed, often high on the agenda, is that it is a lethal gene that is responsible for it's effects. Because of this fact it should only be crossed to an unmarked gerbil, and that if collared are ever crossed to collared, death or deformity is the result of this practice. I feel there is a need to clarify certain aspects of this particular way of thinking as its comments are based around other genes that are as yet not even present in a gerbils genetic make-up. This often leads to confusion and misunderstanding on the subject especially if you wish to embark on a breeding programme with this particular coat variety. When one reads gerbil literature on the effects of dominant spotting, both on the Internet and in books the word lethal gene often pops up. The term is rarely explained in full and much confusion exists on the subject especially where the dominant spotting gene in gerbils is concerned. A true lethal gene causes the death or seriously disables the animal as a result of its effects. For this discussion lethal genes can be separated into two main categories Pre-natal lethal and Semi- lethal. The Dominant spot gene in gerbils should really be termed a Pre-natal lethal gene as it causes the demise of the homozygous embryos and can be likened to the Dominant spot and the Light grey gene in hamsters and also the Dominant white, Dominant yellow and rumpwhite in mice. When two spot, patched, collared or mottled gerbils are crossed together a ratio of two spotted to one normal gerbil results. The reason for this is that the homozygous (SpSp) do not develop in the womb and are never born. In all these cases the heterozygote is the recognised breed or coat variety. Although these animals do not breed true as all spotted individuals must be heterozygous. All animals showing the above phenotypes are known as a form of "obligate heterozygote" as each individual has to be heterozygous because of the demise of the homozygote embryos. The term pied was probably applied to the gerbil because of the similarity of white markings that the dominant spot gene causes in the gerbil, to that of the piebald gene in mice and a host of other domesticated animals. In fact some form of this gene is present in most domesticated animals, and the effects of this gene have been well studied and documented. In humans too, piebaldism and its strange phenotype of depigmented patches of skin and hair has been observed throughout history, with the first descriptions dating to early Egyptian, Greek, and Roman writings. Generation after generation demonstrated a distinctive, predictable familial mark, a white forelock. Families have sometimes been known for this mark of distinction, carrying such surnames as Whitlock, Horlick, and Blaylock. Piebaldism in humans is due to an absence of melanocytes in affected skin and hair follicles, as a result of mutations of the KIT gene. The severity of piebaldism all depends on where the mutation occurs within the KIT gene (melanocytes synthesise melanin, and feed melanin into the growing hair). While piebaldism in humans can be relatively benign, more serious delays in melanocyte migration may then go on to involve the eye, and inner ear, which can then result in deafness, odd eyes or depigmented eyes. These disorders in humans are grouped into the various waardenburgs syndromes. Mutations of the KIT gene occur frequently and the mutations are all semi dominant in effect. The alleles tend to overlap either being not fully recessive or dominant, though certain alleles are more dominant or more recessive than others. Examples of mutations of the KIT gene can be seen in several species of mammals. For example in the rat it is responsible for the various hooded alleles, which produce varying amounts of depigmentation. There are also other genes at work, which influence the layout of these depigmented areas, such as the hood modifier locus. These spotted coat varieties are known in the rat fancy as Irish, Berkshire, hooded, capped etc. Note: There is another separate mutation in rats called white spotting (Ws) that knocks out kit protein, which is produced by the c-kit gene. This can have a variety of effects, one of these being depigmentation. This is very similar, but not identical to the white spotting (W) gene in the mouse. But both genes are mutations in the c-kit gene. In genetics the actual piebald gene is given the symbol S. Nowadays it is also termed Ednrb gene, as it is a mutation of the endothelin-b receptor gene. For simplicity I will stick to using the term S. The S gene is responsible for controlling the distribution of coat pigment throughout the body, and in many species there are several recessive s alleles present on this locus that have been discovered, all of which can affect the severity of piebaldism. Piebaldism and its effects in the mouse are very well documented. In Japan these mice were described in the book "Chingan-Sodategusa" along with a host of other mutations and this was published in 1787. In mice the gene is responsible for such varieties like evens and brokens, and as anyone in the mouse fancy will tell you they present a great challenge to breed well because both the gene and markings produced is greatly affected by modifying genes. Incidentally the Piebald and Dominant spot gene in hamsters were physically very hard to tell apart. One difference was the fact that piebald hamsters often had a white blaze extending upwards from the nose whereas Dominant spots do not. Dominant spot hamsters often have a characteristic white forehead spot. However some Dominant spot hamsters also possess this blaze and piebald hamsters can sometimes have a head spot instead of the blaze! In the Hamster fancy this similarity lead to much confusion between these two genes. The piebald gene (s) in hamsters was a recessive gene and best results (in theory) when breeding was obtained by crossing piebald males with heterozygous (Ss) females. Note how over the years a similar practice has been applied to breeding collared gerbils, i.e. to breed a collared variety with a so called unmarked "carrier" even though it's a totally different gene responsible. Even with these breeding methods the piebald hamster remained difficult to breed and results were often very disappointing, and the gene itself produced several adverse health abnormalities. Because of high mortality and infertility this form of spotting was quickly superseded by the dominant spot gene, this was and still is a much healthier and easier mutant gene to breed. The piebald gene in hamsters is now thought to be extinct. The full collar and blaze on gerbils could have just as easily have been termed "Dutch" by those of us with a fanciful imagination, after the similar markings found in the rabbit or mouse. Although here again it's known to be a very different gene responsible for the markings in the rabbit or mouse, to that which is responsible for the white markings in gerbils. White banded black mice and hamsters can be easily produced by breeders, and the coat pattern is then very similar to Hampshire pigs and also Belted Galloway cattle, but I have never heard breeders from these fancies referring to the stock as "Hampshire's" or "Belted Galloway's". For the more practical amongst us it could have been just as easily given a more accurate and descriptive term such as "collared" or even "collar and blaze". This approach would certainly differentiate it from the mottled coat variety. Breeders would then concentrate on selecting gerbils for a full pure white collar and accompanying blaze and less on a mottled rump. The fact remains that whether the white markings in gerbils are spotted, patched, collared or mottled, the genes responsible for this are the Dominant spot gene plus modifiers. My main point that I am saying is that there are many different genes in small livestock that are capable of producing similar white markings to that seen in the gerbil, and some of these genes are closely associated with adverse health issues. The only issue linked to white spotting in gerbils is a very mild anaemia, so mild it seems to have no effect on fertility, growth, or activity. Because of this I feel the dominant spot gene in gerbils should not be too closely associated with the true piebald gene, which has many adverse health factors, attached to it. At present there is no known gene that produces a true bicolour in gerbils (or tri-coloured if the coat also contains white spotting). The closest breeders in the gerbil fancy come to this is a spotted variety with additional dark patching of the base colour. This gives the gerbil a 3-shaded look. True dark patched gerbils can come in any coat colour, and the dark patched effect is not really dependent on the amount of white on the gerbil. They can occur on gerbils with only a little white on them, i.e. on spotted or patched gerbils. The distinct dark patching seems to be caused by the absence of the diluting effect that the dominant spot gene has on the base colour. The D.P. effect seems to occur randomly in lines of spot, collared and mottled gerbils and cannot be bred for, although the frequency of them appearing in litters increases when you actually use D.P. gerbils for breeding. I have purposefully crossed D.P. gerbils to D.P. gerbils, and it was not until the 7th litter or later that the D.P. effect was observed again, which obviously wouldn't be the case if a recessive gene were involved. However in many other cases I've crossed a D.P. gerbil to another D.P gerbil or even an unmarked gerbil and had more D.P. gerbils in their very first litter. 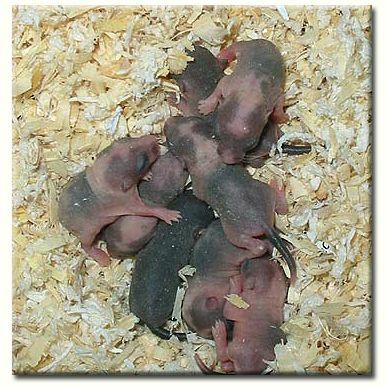 However further D.P gerbils may not have shown in subsequent litters. Initially some breeders working with D.P. gerbils reported that these gerbils showed some signs of infertility, low weight, slow growth and early mortality. However not all D.P. gerbils are affected, and the ones that have appeared in my own stock seem just as healthy as normal spot, collared or mottled gerbils. So not in all cases but some, health problems appeared to be linked to inherited problems with this variety. True D.P. gerbils are biological rarities and are probably the result of some form of genetic mosaicism. Mosaicism itself is thought to be due to a form of mutation in the body cells or some chromosomal accident early in life, which then enables a normally recessive gene to express itself. Because of these factors involved affect body cells and not the germ cells the mosaic like spotting fails to be inherited. Even if mosaicism did involve the germ cells mosaic patterning still wouldn't be inherited, only the genes that produce the effect. The term Mosaic is applied to non -inherited cases, when the effect is brought about by genes it is usually termed Bi-colour. Other reports on this similar phenomenon in gerbils mention that it could even be due to embryo fusion (the opposite of identical twins) this is where two embryos fuse to form a single foetus. If this were indeed the case it would help to explain some of the earlier problems associated with dark patched gerbils. 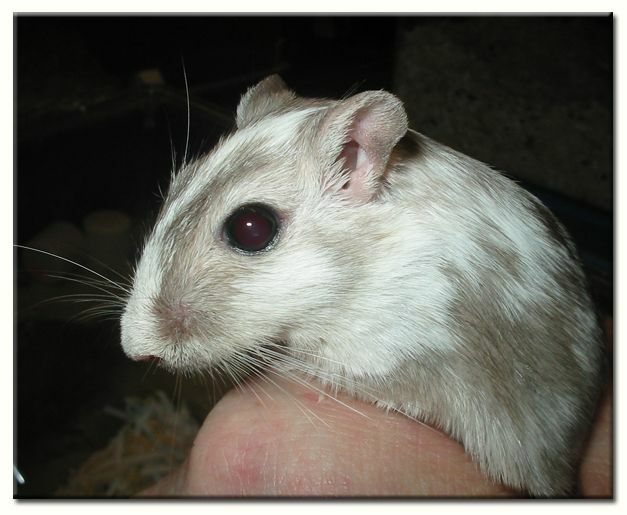 When attempting to breed white spotted gerbils with additional dark patching one should take the above explanations into account, and that this type of gerbils markings do not seem to have a firm genetic basis. It could be a disappointing venture if you based your entire breeding programmes around these gerbils, as your expectations may not be fulfilled. After saying this though, I can see no reason why they shouldn't be included in a breeding programme if they are healthy. As it was pointed out in a previous issue of the Nibbler (NGS Journal) on this subject, breeding for any coat colour and not just spotted varieties, could lead to problems and adverse health if poor breeding practices are followed. It has been well documented in several long-term selection studies using a wide spectrum of different livestock, that over selection for a singular trait may in the long-term have adverse and unexpected effects on other traits ( Lerner,1954, Dobzhansky,1970, Wright,1978, Belyaev 1979 ) In a fairly recent study in 1982 Belyaev and Borodin showed how just selecting for tameness in foxes caused corresponding changes to coat colour, breeding cycles, hormonal profiles, and subsequent bodytrait changes. The adverse effects of selecting for a singular trait is probably most noticeable in cattle, pig and poultry production. Continuously genetically selecting animals for such things as productivity, rapid growth, and high, lean meat yield has unfortunately led to high excitability, excessive nervous behaviour, abnormal behaviour, lowered reproductive ability and a lowered resistance to disease in these animals. These conditions are precursors to serious adverse health conditions if continuous selection for a singular trait is pursued, which in turn may lead to serious animal welfare problems. This is one of the main issues in animal welfare, where breeders have continuously selected animals for rapid growth and high meat production. Examples of this are animals like the broiler chicken, when selecting for high muscle mass, breeders produced very fast growing birds, a downside of this was the skeleton, and internal organs grew at a much slower rate. As a result they cannot withstand much physical exertion, because of reduced cardiopulmonary capacity in relation to muscle mass. When turkeys are selected for extensive muscle growth, it may also make mating difficult, or reduce fertility, so much so that turkeys selected for large breasts are unable to breed naturally. Another example is the Belgium blue cattle that are so heavily muscled that a very high percentage of their calves are delivered by caesarean section. Of course there exists many other examples of welfare issues brought about when breeding for singular traits are pursued and those examples above are but just a few. It appears that there must be some form of common genetic mechanisms which determines coat colour patterning, and many different domestic animals have similar white markings, dogs, cats, cattle, rodents etc, all share similar types of patterning. With depigmentation both scientists and breeders have realised that the effects can be both good and bad. Partial depigmentation appears to be correlated with high production in livestock, and also placid behaviour. The Holstein and Hereford cows are regarded as two of the calmest breeds of cattle. Also in Belyaev's study mentioned earlier, on tameness in foxes, the tamest ones developed a piebald like coat pattern! Unfortunately excessive depigmentation has also been linked to serious developmental and neurological problems. This can be observed in several species. It's been well documented in other fancies that depigmented animals are often deaf. Also excessive depigmentation has been linked to being detrimental to the visual systems in animals. There is definitely a link between depigmentation, albino genes, spotting genes, and nervous system problems in mammals (Silverside and Smythe 1986), however the links in gerbils seems very much lower. The pseudo-albinos in the gerbil fancy, while we all agree that their vision is impaired by a lack of pigment, they do not require any special assistance, they are not hyperactive, nor prone to seizures or inner ear problems. They are not markedly disabled by a lack of pigment and to all extents they lead a happy and pain free life. Incidentally for the purists who believe that a white rodent couldn't survive in the wild, there is a brief mention in Science by Minckler and Pease (1938) of a feral colony of albino rats inhabiting a local dump in Minnesota. It was presumed local students set them free and they thrived. Presumably because of abundant food and water that was available, and also a lack of predators. The mottled gerbils I have bred all look and behave normally, other than being exceptionally placid there doesn't seem to be any behavioural faults. Parenting ability is also good, although one or two pups in litters may suffer from respiratory infection, but no more so than any other of the coat colour varieties that I keep. I have also noticed that they drink more than other coat colours but not excessively so. Also I've noticed that D.P. gerbils fail to grow as large as their spot/patch, collared or mottled counterparts. Apart from the above notes that I have mentioned I can find no other differences or abnormalities in health or behaviour. To answer this question we need to go back to the embryo. In the developing embryo a fold develops down the back of the animal called the neural tube, which contains an active region called the neural crest. This region is responsible for supplying the melanocytes cells that migrate all over the body. These then take up positions at the base of hair follicles. Melanocytes synthesise melanin, and then feed that melanin into the growing hair. In normal conditions all follicles have melanocytes associated with them so that all the animals fur is pigmented, but if for some reason no melanocytes are associated with a follicle the hair becomes unpigmented. So mutations that affect melanocyte distribution in the growing embryo determine which parts of the body have melanocytes, and produce pigment, and which parts have no melanocytes and produce depigmented hairs instead. Kit gene mutations, (a gene responsible for depigmentation) delay the migration of melanocytes from the neural crest, so that the areas furthest from the animals dorsal midline, ie its feet, chest and belly, fail to get any melanocytes and these areas produce depigmented white hair. Because melanocytes are found in the central nervous system, which includes areas of the brain responsible for mood and responses to stress they can radically effect behaviour when migration is impaired. So, when Belyaev selected his foxes for tameness as mentioned earlier, this also changed melanoblast* migration in the developing nervous system which in turn produced, placid, tame animals. A side effect of this behaviour selection is the change in melanoblast migration patterns in the skin, which then in turn leads to a piebald coat. As mentioned earlier, melanocytes are also found in the inner ear and eye so impaired migration of melanocytes in these areas can result in occasional deafness and depigmented eyes. This can be seen in white, blue eyed deaf cats and dogs, and also in white faced deaf ferrets (waardenburg syndrome), and also in odd eyed hooded rats. *Melanoblasts These are the precursers to melanocytes. Melanoblasts that migrate from the animals back (dorsal area) from the active neural crest region, then take up their places at the base of hair follicles and become Melanocytes. These melanocytes then make the pigment for the hair. The very first mottled gerbil I bred came from Colourpoint Black collared lines, and it was the only heavily mottled gerbil that came out of many litters. One of the things I often noticed when I started breeding collared gerbils was that the Colourpoint slate and Colourpoint black collared varieties often had much more white on them than their slate or black collared varieties parents or littermates. This first mottled gerbil I bred was then outcrossed to a Colourpoint slate collared line. The resulting offspring from subsequent litters were mainly heavily marked collared patterns, but not something I could class as heavily mottled. I decided at this point to backcross a daughter, a pink eyed white back to the mottled parent, at the time I was hoping the additional diluting genes in the pink eyed white plus the backcross, may increase the chances of producing more mottled gerbils. This approach worked for me, and in subsequent litters several heavily mottled Colourpoint Gerbils were produced. All the mottled gerbils produced were now my foundation stock and these individuals in turn were outcrossed to many different collared lines, always selecting for the most extensively marked collared patterns. During this period I was also experimenting with spotted Dark-Eyed Honey lines and outcrossing them to other colours, some of these lines had an additional c(h) gene present. The reasons for this were that I wanted to see if the strange effect of ee plus Sp would affect the outcome of these outcrosses. Also I wanted to find out if adding in another recessive gene, a gene that in my mind reacts strangely with the dominant spot gene, greatly increasing the white on the animal. Although there wasn't any noticeable difference or extra white markings on the offspring, when these pups were outcrossed to either of the Colourpoint slate or black collared/mottled lines the offspring produced dramatically improved their mottled markings. Although only hypothetical, I was then wondering if c (chm) and ee, especially if combined with other diluting genes played a part in influencing further modification to occur to the Dominant spot gene? It is assumed that the transition from spot to patch, patch to collared, and collared to mottled is controlled by modifying genes or modifiers. These genes modify a characteristic rather than change it sharply. The minor genes responsible for these changes that regulate the amount of white marking could be many and are referred to as polygenes. Each probably have a small effect individually but they will also work cumulatively so that a noticeable change occurs in the amount of white markings. So do the various recessive colour genes which also have diluting effects work in a similar cumulative fashion to influence the overall amount of white markings in a gerbil? Or do these genes have additional modifiers attached to them that are "switched on" in the presence of the Dominant spot gene? It has also been recently noticed by continental breeders that with the new dilute (d) gene when it is bred to spotted gerbils; it often causes a further extension of white markings on the gerbil. Another interesting point that I noticed was that if I used the non-spotted gerbils from the heavily mottled litters and outcrossed them to collared or even patched lines, often a mottled or two is produced in the otherwise patched or collared lines. This of course could just be due to good fortune, but I've noticed this on several occasions where the non-spotted gerbils from mottled litters were used in crosses. As Kathryn Roles mentions in her article in the NGS journal, "In all my time breeding pied gerbils I have never been able to produce a heavily mottled animal using carriers", well in short, neither have I, But I have produced some excellent collared types from crossing a collared type to an unmarked collared carrier! And it also seems the case in my experience that you can produce mottled gerbils when crossing patch, collared or mottled to a mottled carrier. Even though with this method I have eventually produced good mottled gold and grey agouti, and slate and black mottled, as judges on the showbench prefer these more traditional colours, they can often look inferior to their Colourpoint mottled cousins in respect of white mottling. Producing good mottled gerbils in these traditional colours are much harder for me to breed on a regular basis. If you devote a large number of breeding lines to patch, collared, and mottled lines, so that you are not inevitably forced to inbreed, but to linebreed with well-defined goals, healthy mottled stock can be safely obtained. Direct brother to sister mating with any coat colour variety and not just spotted can lead to loss of vigour, fertility, and adverse health, etc. Inbreeding does have a use in fixing certain advantageous traits, but with mottled gerbils there is really nothing to "fix", only the effect of mottling needs to be passed onto the offspring. One other point about breeding, which I feel is worth mentioning, is to never knowingly breed potential faults or health problems into your stock. For example, if in any litters you have to administer Baytril or some similar antibiotic to your pups due to respiratory problems, never be tempted to breed these recovered gerbils with your own stock, no matter how beautiful you think the coat is. By all means take the gerbil and enter it into a show, but never be tempted to breed with this animal. The same goes for any new stock being introduced to your own lines, make sure they are fully quarantined, and monitor their progress closely for any problems as their genes interact with your own bloodlines. Spot, patch, collared or mottled gerbils can be safely outcrossed to other spot, patch, collared or mottled gerbils and no deleterious effects have been noticed by myself by adopting this breeding practice. Pups in litters can range from two to eight individuals. The lifespan of these gerbils are no more or less than any other coat colour variety, and show no outward signs of any health problems. And to the best of my knowledge there are no gerbils in litters with a "double dose of the marked gene" as it is genetically impossible for such a gerbil to exist. The inner ear problems mentioned in early collared gerbils were most probably the result of poor inbreeding programmes and also breeding for a singular trait. These faults could easily be repeated by severely inbreeding any coloured gerbil and not just collared varieties. In my opinion the mottled gerbil is a wonderful addition to the many coat colour varieties available in the Gerbil today, and it would be sad if this coat variety was eventually lost or not bred for, through ignorance or prejudice. Targeted and natural (piebald-lethal) mutations of endothelin-B receptor gene produce megacolon associated with spotted coat color in mice. - Hosoda K, Hammer RE, Richardson JA, Baynash AG, Cheung JC, Giaid A, Yanagisawa M.
Mouse genome informatics-alleles and phenotypes.